I'm really lucky that my brother-in-law Mark is an exceptional chef and is the head chef at his own restaurant in Whitley Bay, Evan's Bistro. We asked my Mam to Babysit so we could have a night out for Valentine's Day. We don't really make a big fuss of Valentine's Day (we don't even get each other cards or anything) but we still like to have a good meal. Mrs. Cool helps with their facebook page and we decided to kill two birds with one stone and combine our date night for Valentine's Day with taking some photos of the amazing food at Evan's Bistro. For starters Mrs. 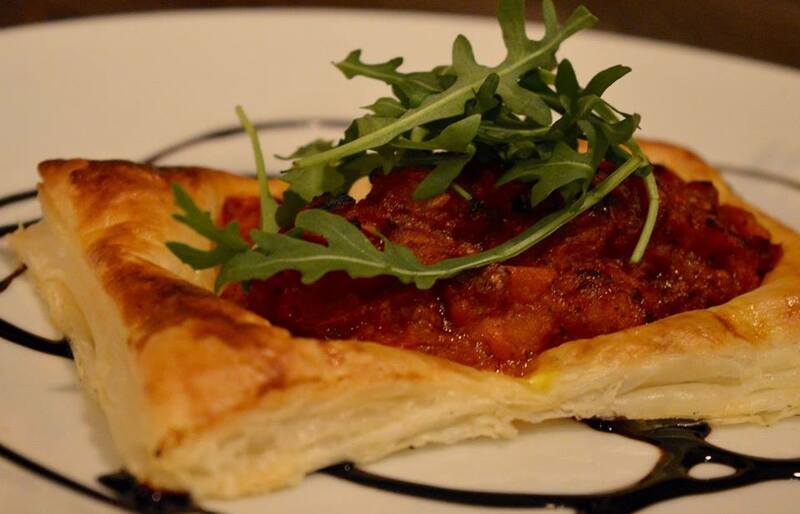 Cool ordered the Roasted herb, tomato and garlic tartlet with rocket and olive oil. This dish is suitable for vegans and I was surprised Mrs. Cool ordered it as it's not something she would normally go for. The pastry was perfectly flakey and the filling was full of rich tomato flavour. I was torn between a few of the starters but in the end the combination of black pudding and poached egg won me over. 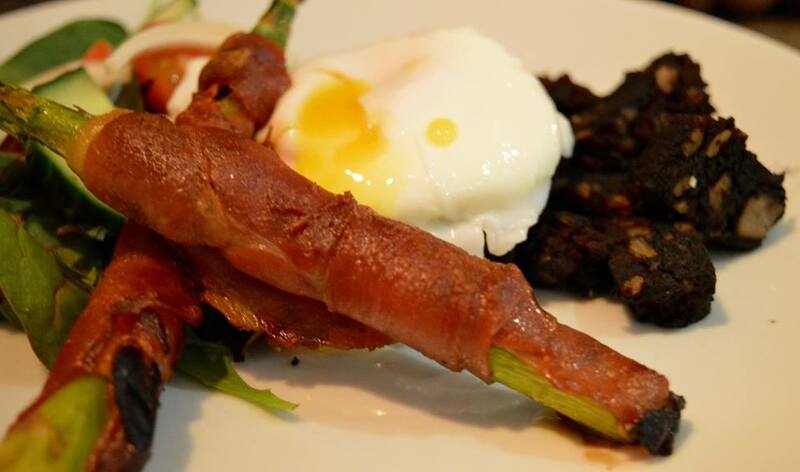 I ordered the Seranno wrapped asparagus, black pudding and poached egg. I love asparagus when it's wrapped in crispy ham. I'm a big egg fan and black pudding is always a must when I see it on a menu. The black pudding from Evan's Bistro is unreal and my poached egg was perfectly runny. For mains Mrs. Cool, being the dainty lady she is, went for a massive cut of beef and ordered the 8oz sirloin steak topped with honey and chilli king prawns, house chips and salad. The steak was cooked perfectly (Medium), the king prawns were very juicy and the chilli sauce was also great. Now, I need to spend some time talking about the chips. Evan's Bistro's chips are just the best. Remember when you were a kid and your Mam would make proper chips for tea? That's what the chips at are like at Evan's, like a nostalgic blast from the past. I was in the mood for some fish so I ordered the Oven baked hake fillet, braised greens, spring onion rosti, crisp pancetta and a caper butter. The Hake was beautifully flakey but not dry and went really well with the saltiness of the crispy panchetta, The spring onion rosti was also delicious. As it was Valentine's day we decided to treat ourselves to dessert. Mrs. Cool ordered the melt in the middle chocolate fondant and vanilla bean ice cream and when she cut into it it oozed with chocolatey goodness. 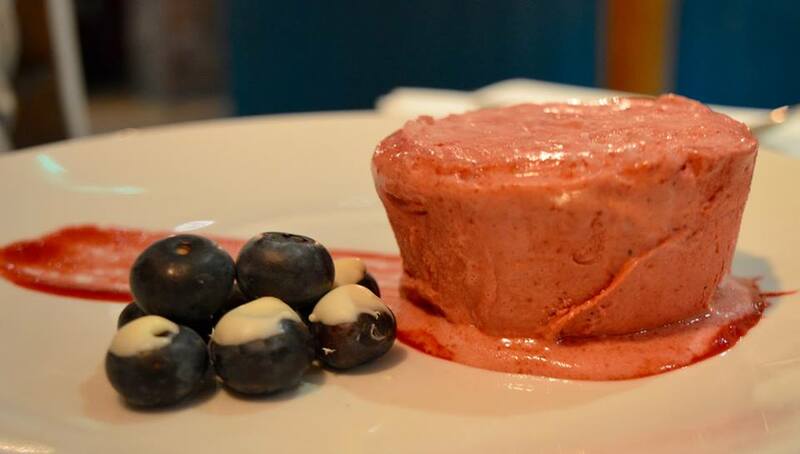 I went for the frozen berry soufflé, chocolate dipped berries and fruit coulis. I was interested to see how a frozen soufflé turned out. It was kind of like a frozen yoghurt but more creamy. The berry flavours were very fresh and it was a perfect palette cleanser. As Mrs. Cool was taking photos we also had to order the profiteroles and these are the best profiteroles we have ever had. 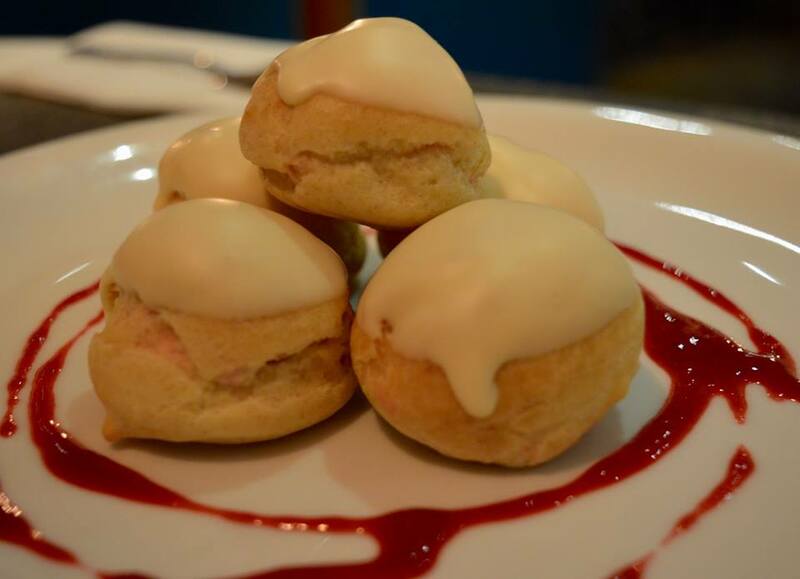 They were made in-house by apprentice chef Jenny who has a passion for desserts. They are dipped in white chocolate and have a raspberry cream filling. I may be biased but I have never had a bad meal at Evan's and I'm not the only one as you can see from the reviews on their facebook page. 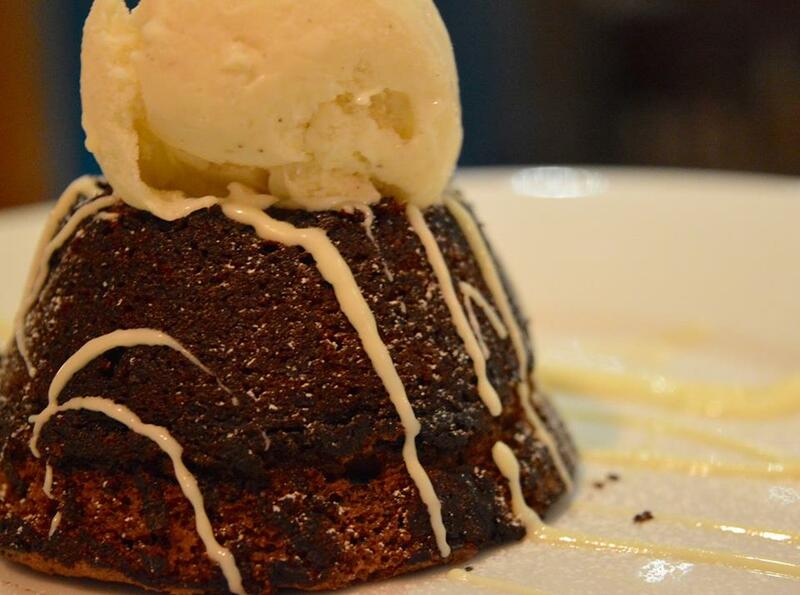 Although Valentine's is over I'm already looking forward to my next visit to Evan's Bistro. If you haven't been before then get yourself a table next time you're in Whitley Bay. They have a great main menu and their kids menu is really good. They're also a kids play area and are dog friendly.